I've been meaning to read this book for years. 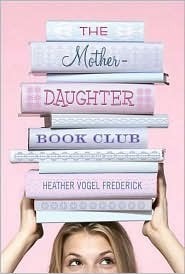 The concept of a Mother-Daughter Book Club sounded wonderful. The Mother-Daughter Book Club fulfilled my expectations. Four 6th grade girls, who are all polar opposites, are forced by their mothers and father to participate in a monthly book club. Over the course of the year, they make their way through Little Women. The girls' personalities resemble the four daughters in Little Women. Cassidy, the hockey obsessed jock, is most like Jo...just a bit different than the typical girl. Emma is like Jo in that she's a writer but like Meg in other ways. Megan is like Amy - artistic and selfish. Jess is Beth - quiet and sweet. Throughout the year the girls' lives interweave far beyond the book club. They go to the same school, so are involved in the same sports events, plays, and dances. Emmma and Jess are best friends. Cassidy is very different than Emma and Jess, but quickly becomes their friend. Most of the conflict revolves around Megan. She hangs with the popular, mean-girl crowd led by Becca Chadwick. They delight in making fun of everyone, but especially Emma who can't afford new clothes and Jess, Goat-Girl, who lives on a farm. Their cruel pranks and comments perfectly fit with my memories of middle school. Megan has to decide if she really wants to hang with girls specializing in cruelty or be with her kinder but less popular book club friends. I especially like the portrayal of the parents in the book. They are not perfect people. They embarrass the girls, they lose their tempers, they place their own hopes, dreams, and fears before that of their daughters. This is the age where kids really start discovering their parents flaws and it's nice to see a book that portrays parents realistically as good but imperfect people. The book wraps up the conflicts pretty neatly, perhaps a bit too neatly to be real. Still enough issues were left unresolved to provide interesting plot points and conflict for future books. All in all, a pleasant and enjoyable read! I keep meaning to read this book too! It looks so cute. I'm glad you enjoyed it. I love books with good characters, characters who are flawed and therefore believable. Many thanks for this recommendation, I'm adding it to my library list.